Jenny Rees, Extension Educator in Clay County: Two months of humid, wet weather have allowed for corn disease development in south central Nebraska. Scout fields to know whether you have mostly bacterial or fungal diseases and consider disease pressure, where on the plant the disease is occurring, growth stage, and economics. When possible, consider delaying a fungicide application until later for economic and resistance-management reasons. Anthracnose is being found on lower corn leaves, particularly where we've had high amounts of rainfall, standing water, and/or hail. Goss' wilt has been observed in corn fields in south central Nebraska, typically along field edges, pivot tracks, pivot/well roads or in hail-damaged firleds. Goss' wilt (bacterial disease) has been observed in fields, typically along field edges, pivot tracks, pivot/well roads or hail-damaged fields. Plant wounds allow entry for this bacterial pathogen. Physoderma brown spot typically doesn't occur in our area until tasseling (which is where we are at now in some fields); however, I was seeing this as early as two weeks ago on some hybrids. The pathogen causing this disease is a fungal-like pathogen that moves with water. You will notice a purple/brown color on midribs of leaves, leaf sheaths, stalks, and tiny yellow/brown/purple spots on leaves. This disease isn't considered yield-limiting or of significance in Nebraska. It can be confused with southern rust, but Physoderma brown spot does not produce pustules. Rust has been visible in the mid and lower portions of corn canopies. Gray leaf spot is being found in some lower leaf canopies. It is easy to confuse with anthracnose as both diseases appear a little different on various hybrids. Gray leaf spot will be vein-limited while anthracnose is more blotchy in appearance. For more photos and the full report see JenREESources Extension Blog. Figure 1. Multiple lesions from Northern corn leaf blight on lower leaf in a continuous corn field in Washington County. Nathan Mueller, Cropping Systems and Ag Technologies Extension Educator, Dodge County: Northern corn leaf blight first became visible three weeks ago in Dodge and Washington counties. 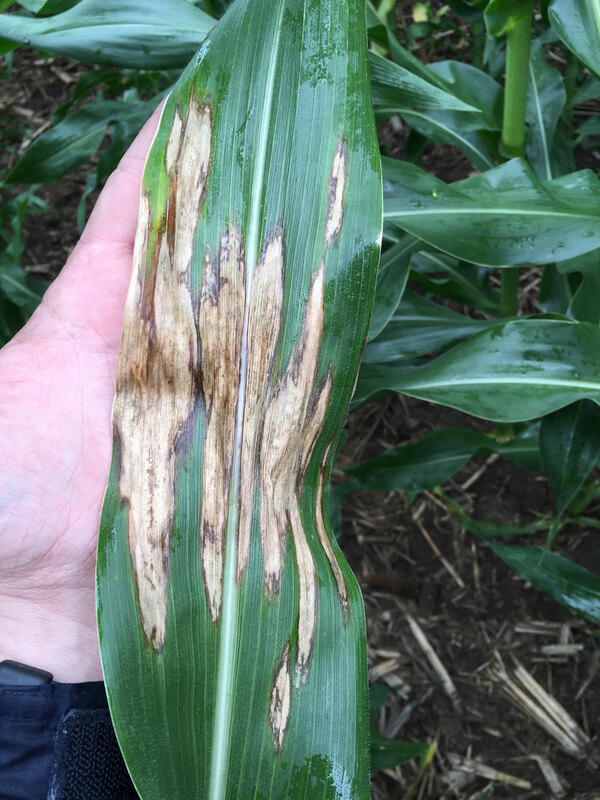 The disease severity has been increasing in some high risk environments (disease present last year, corn-after-corn, and a moderate to susceptible hybrid). In low risk environments, such as corn planted after alfalfa, lesions have not been observed. However, some NCLB lesions can be found in many no-till corn fields that followed soybeans and more prominently in corn following corn where a susceptible hybrid was planted (Figure 1). In some of these higher risk growing conditions, the disease has spread within the corn canopy to upper leaves. Hybrids with both low to moderate ratings are being impacted in these environments. Septoria brown spot on the lower leaves in the soybean canopy can already be seen in the area, which is not a concern unless we see progression of symptoms upward in to the mid-canopy. In spite of the wet weather, some area producers have been concerned about the amount of grasshoppers in field borders this week. Scout all corn fields for Northern corn leaf blight to determine which fields may warrant fungicide application at tasseling. Monitor grasshopper pressure in field borders. Scout soybeans for Septoria brown spot in the lower canopy and watch for upward movement in the coming weeks. For more crop reports from east central Nebraska see the Crop Tech Cafe blog with Extension Educators Nathan Mueller, Aaron Nygren, and John Wilson.